April confidence indicators in France showed a stabilisation across sectors. There was a small uptick in consumer confidence, which reached 100.7 in April, still below last year’s average or January’s peak (104.2). Consumers remain very positive on upcoming labour market developments, although a bit less so than in March. At the same time, they are slightly less worried about their future financial situation (although they were more optimistic last year on that matter) and their purchasing intentions improved to their most upbeat level since September. All in all, if consumer confidence were to continue to improve in coming months, then current figures would still be compatible with a private consumption growth acceleration in the first half of the year, from the slow 1.3% YoY registered in the last quarter of 2017. We still expect this important growth driver to rebound from 1.3% growth in 2017 to 1.8% in 2018. Lower confidence among companies across sectors - in particular in the manufacturing industry - have been registered in the past three months throughout Europe. One reason is the strength of the rebound these indicators registered in the second half of 2017, others can be found in a strong euro and the threat of returning trade wars after Donald Trump's controversial rhetoric. This is probably affecting French companies’ confidence more than the strikes that are slowing down French activity in the air and rail transport sectors. However, compared to the recent correction in the IFO indicator in Germany, confidence among French companies remains elevated. 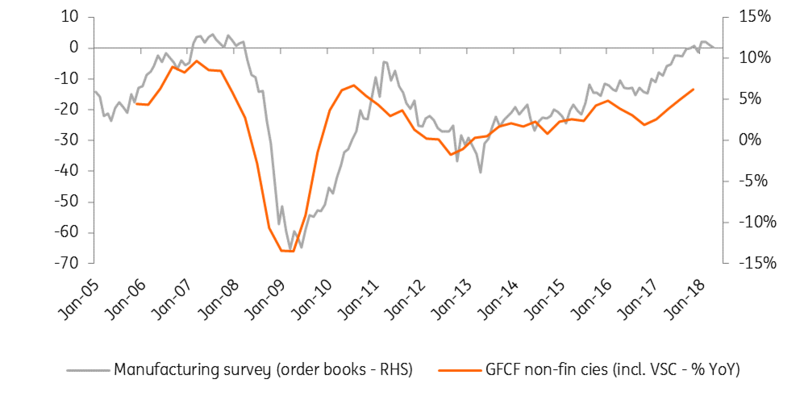 Figures published this week by INSEE show that in industry, companies remain confident in the general outlook: if the index has been decreasing in the last 5 months, it remains at its 12-month average while order books are still seeing inflows. However, at 109, the main industrial confidence index was lower in April than the last two quarters’ average. We are likely to see similar figures in May, showing a consolidation of growth prospects at a high level for 18Q2, but without further acceleration. In the service sector, confidence has been stable in the past three months, just below its January peak (109), at 107 in April. Hiring and investment intentions, in particular, remain upbeat at the start of the second quarter, boding well for the current trend of declining unemployment. All things considered, we think that GDP growth should continue to accelerate in the second quarter after 18Q1’s uptick, which we are likely to see in the figures published on 27th April.